Warraq el-Hadar is a small island in greater Cairo's Nile river (Giza governorate, part of Greater Cairo). It is a poor district. 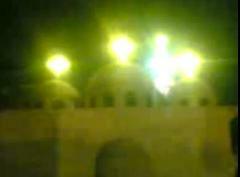 More than 200,000 (Christians and Muslims) have so far witnessed the December 2009 apparitions on the domes of Virgin Mary and Archangel Michael Coptic Orthodox Church in El-Warraq (as at 22 December 2009). Apparition lights in the night sky could also be seen several kilometers away from the church. People used their mobile phones to make videos of the apparitions and share them via Bluetooth and on YouTube. The full silhouette of the Blessed Holy Virgin Mary dressed in light blue gown could be clearly seen over the domes of the church between the church crosses. 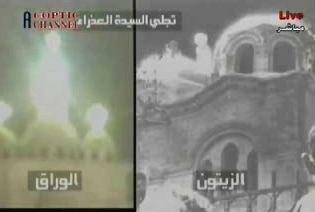 The apparitions also received wide media coverage in Egyptian newspapers and Arabic TV channels. The apparitions started in the Coptic month of Kiahk (December 2009), the Marian month/Nativity Fast in the Coptic Calendar. During this month the Coptic Church celebrates a special Midnight Praise dedicated to the Holy Virgin and the Incarnation. The Bishopric of Giza announces that the Holy Virgin has appeared in a transfiguration at the Church named after her in Warraq al-Hadar, Giza, in the early hours of Friday 11 December 2009 at 1:00am. The Holy Virgin appeared in her full height in luminous robes, above the middle dome of the church, in pure white dress and a royal blue belt. She had a crown on her head, above which appeared the cross on top of the dome. The crosses on top of the church’s domes and towers glowed brightly with light. The Holy Virgin moved between the domes and on to the top of the church gate between its two twin towers. The local residents all saw her. The apparition lasted from 1:00am till 4:00am on Friday, and was registered by cameras and cell phones. Some 3,000 people from the neighbourhood, surrounding areas, and passers-by gathered in the street in front of the church to see the apparition. Since Friday, the huge crowds gathered in the vicinity of the church have been seeing luminous white pigeons soaring above the church during various times of the night, as well as a star which emerges suddenly in the heaven, travels some 200 metres across, then disappears. The huge crowds gathered around the church do not cease singing hymns and praises for the Holy Virgin. This is a great blessing for the Church and for all the people of Egypt. May her blessing and intercession benefit us all. On this page, you will find a compilation of videos and Arabic and English articles about Al-Warraq apparitions. All glory be to God! "If I could only see Her tonight, it will be the happiest day of my life," said 25-year-old sales representative Fadi Amir. He had been standing all night, his eyes fixed on the church's towers in hope of catching a glimpse of the Virgin Mary. "Whether I see Her or not, I know She's there," said a young lady, shivering with the cold as she stood on the opposite side of the road to get a better view of the church. Whether waiting for a miracle to happen or just watching for something unusual, the crowds that gather daily in front of the Church of the Virgin Mary and Archangel Michael in Warraq, Giza, could not be more positive about what they are doing. And when solving the simplest daily problem all too often involves insurmountable obstacles, who can blame people for seeking the miraculous. It is not unusual to hear reports of the Virgin Mary's appearance every now and then, particularly among Copts. And as on this occasion, the news spreads like wildfire. According to Father Dawoud of the Church of the Virgin Mary and Archangel Michael neighbours, worried by crowds gathering outside, called at midnight on 10 December to ask if something was wrong. "The phone calls poured in and many people said they had just seen an apparition of Virgin Mary on the right dome of the church," said Father Dawoud, who added that Muslim neighbours were among the callers, including "Haj Rashad, a neighbour and a dear friend who told me, 'what are you doing here, father? 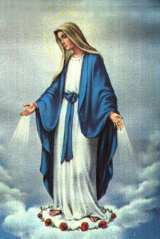 I have just seen Our Lady Mariam with my own eyes, go and see for yourself'." "At first we thought that a little kid was playing with a flash light, but then the light intensified and moved from the tree in front of the church entrance up to the right dome and an embodiment of Virgin Mary could be easily recognised. It stayed there for a while. I have captured the scene with my mobile phone," says Hassan, the neighbourhood distributor of gas cylinders. On Monday the Coptic Orthodox Bishopric in Giza issued a statement: "On 11 Friday, at 1am, a full apparition of the Virgin Mary on the right dome of the church was reported by at least 3,000 people. She appeared in her usual heavenly blue costume. She was crowned and the concrete cross on the dome was placed on top of her crown. Those present captured photos and videos of the Holy scene," read the statement. The scene, as described, was broadcast on Amr Adib's talk show "Cairo Today" on 13 December. According to Bishop Theodosios of Giza, it was important to investigate the event in detail. "I stayed up all night on Sunday. I saw doves appear suddenly in the sky. They flew in circles in front of the church before they vanished into thin air. They were floating rather than hovering with their wings," said Bishop Theodosios, adding that it is uncommon for doves to fly at night. What makes the claims credible for many Copts is the fact that reports of the apparition coincided with the beginning of the Coptic month of Kiahk, better known as "Mary's month", dedicated to praising the Virgin's conception of Christ and ending with the Coptic Orthodox Church's Christmas celebrations of 7 January. For security forces the event has a different dimension. Selim, a policeman, pointed out he had been on duty at the site for seven hours already and did not expect to be relieved for another five. "The police are exerting a tremendous effort and they have been very cooperative," says Father Dawoud, who also praised church neighbours, many of whom allowed visitors to view the church from the roofs of their buildings. The coffee shops -- there is one on each side of the church -- also find cause for celebration. Profits have spiralled. "We've never had so many customers and they are there all night long," says Hassan, a tea boy. "We even rent chairs for LE3 per night." Apparitions of the Virgin Mary are present in the minds of a majority of Copts. The longest and best documented occurred in the church named after her in Zeitoun in April 1968. Sightings continued for almost two years. The event was witnessed by millions, including President Gamal Abdel-Nasser, and was associated with miraculous cures. In 1986 a similar event took place in Saint Demiana the Martyr's Church in Papadouplo, Shubra. In 1997, a small church in Shentena Al-Hagger in Menoufiya hosted thousands of Copts following news of an apparition. In 2000, St Mark's Church in Assiut, 300km south of Cairo, was the scene of similar sightings. "If the sightings continue a fact finding committee will be formed to investigate the matter and they will submit their report to Pope Shenouda III, on which basis he may issue a papal declaration," said Bishop Theodosios. © Above article is Copyright Al-Ahram Weekly. Copyright © 1996-2010, Zeitun-eg.org. All rights reserved.